Thank you for your interest in becoming a Volunteer. GiGi’s Playhouse is a volunteer-run organization and we rely on the skill and dedication of volunteers of various levels of expertise to keep our programs vibrant, educational, fun and free. Since the first Playhouse opened in 2003, GiGi’s Playhouse programs have always been free for our families. Parents, family members, clinicians, and individuals who believe in the GiGi’s Playhouse mission act as volunteers in GiGi’s Playhouse programs, events, administrative offices, and on our Parent Leadership Team. If you are interested in donating your time and talent, let us know! GiGi's Playhouse offers purposeful, progressive, therapeutic, educational and social programs throughout the month and on the weekends at designated times. We are always in need to Leaders and Volunteers for all of our amazing programs! Program Leaders and Assistants: The Program Leaders plays an integral role within GiGi’s Playhouse Programs – to facilitate skill development activities and connect with families. It is preferred that the Program Leader has advanced education and/or training in developmental therapy, occupational therapy, physical therapy, behavioral therapy, social work, special education, speech-language therapy, music, dance, art or a related field. Program Volunteers:  These people will assist the program lead during the program. They will help with activities, set up and clean up as needed. Program volunteers just need a general knowledge of Down syndrome which you can gain at the volunteer orientation! Host Familes: The Host Family attends the assigned program each session and works in conjunction with the program leader. Greets participants and makes sure they check in and out on our electronic check in Ipad. Interested in helping participants learn to read, learn number concepts, and develop career skills? Then our tutoring or educational programs are perfect for you! We have specific training for tutors which include observation hours and continued support. Help make a difference! Literacy Coordinator: key volunteer that supports and oversees the GiGi’s Playhouse Literacy Tutoring Program. This volunteer position requires a commitment of 5-12 hours per week. Literacy and Math Tutors:  This is an exciting opportunity to help those with Down syndrome learn to read or do math skills! The time commitment per week is 1 hour plus prep time. We ask our tutors to commit to one session (10 weeks). You will work directly with the family of the child you are tutoring to determine when you will meet for your session each week. GiGi University Assistant Teachers: Assist our GiGi U adults as they learn and develop their abilities in the areas of wellness, communication and career skills with emphasis on job interviewing, communication skills, money management, public speaking, customer service, computer skills, team building and wellness. Hugs and Mugs Studio Cafe Volunteers: Assist our GiGi University graduates during their internship as they work on site at our Studio Café and gift shop. Help our interns manage different aspects of a real-life retail environment- from managing money transactions to customer service and inventory control, fulfilling online orders, safe food handling skills, employee training and more. Like to be on the computer? Like to work on projects? Good at fixing things? Every Playhouse is always looking for administrative, maintenance, and tech volunteers to help with various tasks. Commitment:  Varied-These can either be 1x week, 1x month or on an as needed basis. Volunteer Coordinator: support and oversee recruitment, orientation, scheduling, training and recognition of volunteers within the Playhouse. This volunteer position requires an average commitment of 5-15 hours per week. Clean Team:  Come in at least once a month on a Saturday afternoon to clean toys, organize and decorate. This is a great opportunity for youth groups, businesses etc. Handyperson: touch up painting, fix broken toys, replace smoke detectors, lights, etc. PR “Street Team”/Playhouse Ambassador: High energy, upbeat volunteers needed for off site events to represent GiGi’s Playhouse at Special Olympics, Golf Outings, various conferences, and community festivals. Attend local events (host a table/booth), reach out in the community to share your enthusiasm and knowledge of GiGi’s Playhouse and other duties! GiGi's Playhouse has exciting events that are run by volunteers!! 5K Walk/Run, GiGi Fest, Gala, World Down Syndrome Celebration, Holiday parties…you name it! We are always in need of volunteers for these events – from being a committee member to helping the day of the event, we need your assistance! Chairperson:  Oversee the committee and event, some experience with event/people management preferred. Marketing/PR:  Write Press releases, follow up with media, create flyers, brochures etc. Day of Volunteers:  Helping with registration and other activities. Group Volunteering:  Have a group interested in volunteering together? The more the better! 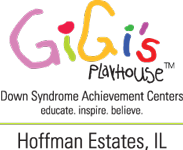 Contact us at volunteerhoffmanestates@gigisplayhouse.org  and together we will set up your volunteer opportunities! To become a volunteer you must complete the following steps. Read our website in order to familiarize yourself with the Playhouse mission, vision, programs and events.